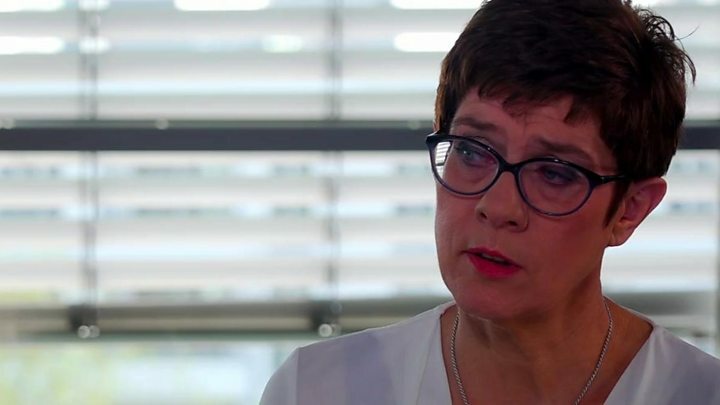 Media captionAnnegret Kramp-Karrenbauer: "Brexit has been a strain on all of us"
"Have you heard about the British party guest? He's the one who announces he's leaving, then you find him hours later wandering around the house with no money for a taxi. When he finally goes, he takes two bottles of wine with him." "Fisch und Tschüss" is a slogan for the satirical news programme, The Heute [today] Show - a play on words for the traditional UK dish, fish and chips. Except Tschüss in German means goodbye. After initially mourning the UK's vote to leave, then following every twist and turn of negotiations for a while, many Germans now feel alienated from the process. They can't keep up with what's going on in the House of Commons. "I no longer care so much how Brexit ends," you often hear. "As long as it ends." "Brexit has been a strain on all of us. In some ways it has paralysed us," Annegret Kramp-Karrenbauer told me in Berlin in a UK exclusive interview. She's the leader of Germany's CDU party, very close to Angela Merkel and widely tipped to be the next German chancellor. Ms Kramp-Karrenbauer - also known as AKK - is far from detached when it comes to Brexit. Now, the EU's determined attempt to show unity at all times over Brexit means it has been frustratingly difficult to get EU leaders to agree to in-depth, on-the-record Brexit interviews . "Anything that keeps the UK close to the EU and best of all, in the EU, would make me personally very happy" she told me. "Maybe that could result from the current talks between Theresa May and Jeremy Corbyn." She hopes for a second referendum - but only, she said, if the majority of UK citizens felt it would heal the country rather than exacerbate divisions further. With the deadline for a Brexit decision looming next week on 12 April, Ms Kramp-Karrenbauer believes the risk of the UK leaving without a deal have "risen dramatically". This is something German business find no laughing matter. The BDI Federation of German Industry warned Germany would lose at least 0.5% of its GDP - and this at a time when the German economy is already heading south. Instead of "no-deal is the most likely scenario" or "if Theresa May requests a longer extension, we'll attach really tough conditions", which we've got used to hearing by now, Mrs Merkel chose the words: "Where there's a will, there's a way." There is no common EU position on this yet. That's putting it politely. Verbal fisticuffs are predicted at next week's emergency Brexit summit when the 27 EU leaders come face-to-face. The man who represents all of them here in Brussels, President of the European Council Donald Tusk, thinks he may have found a solution. However, it doesn't exactly roll off the tongue. He's proposing what he calls a "flextension", which could see the UK signing up to a one-year-long Brexit delay with the option to cut it short as soon as parliament ratified the Brexit deal. Mr Tusk believes the arrangement would suit the EU and the UK - and as one EU official put it to me, it would avoid Brussels potentially being faced with "endless" UK requests for repeated short extensions every few weeks. EU leaders will discuss Mr Tusk's proposal at next Wednesday's summit. By law, their decision must be unanimous. "If the UK now came to us and said, 'let's spend five days negotiating non-stop on how to avoid the backstop', I can't imagine anyone in Europe saying 'No'. If the UK had new watertight proposals for the border, I don't think anyone in the EU would say, 'We don't want to talk about it.'"